After two character-driven episodes, although the latest chapter of Suits contained a good dose of character development (more on that later), it was a return to the show’s usual rhythm, as we see the characters navigating New York’s legal and business world, while handling a few personal challenges along the way. Overall, it was an enjoyable hour of television; however it wasn’t as satisfying in my view as the last two weeks have been. There was lots to enjoy in 6.13, wittily titled Teeth, Nose, Teeth as a reference to Louis Litt and as Louis was my favourite character this week by a mile, I’ll start there. Last week was all about Harvey’s personal growth, but this week highlighted he isn’t the only member of PSL to be experiencing a period of personal change. After Rachel turns to Louis with news that the legal and ethics committee of the Bar have refused her an interview, he doesn’t wade in, explode and make things ten times worse. Instead, he talks the situation through with his fellow named partner, Harvey, and they agree a strategy together! Louis accepting his and Harvey’s strengths was a stride forward for him. The fact he followed this up with asking for Harvey’s advice on his personal life and then actually handled that situation in a rational, mature and loving manner made me want to cheer! Louis Litt (Rick Hoffamn) – character of the week! I do worry though that his relationship with Tara will not end well. Maybe I’m a pessimist, but she comes across as a woman using Louis’s generous nature to have a reliable support in her life. I’m not convinced she loves him and it’ll be a shame if, after this growth, we still don’t see him happy. In fact, with Louis changing for the better and Harvey yet again skirting around the law, perhaps Louis is becoming the man more suited to run PSL in the long-term and I never thought I’d say that! As for Harvey, it was great to see him more relaxed this week than he’s been in a long time. He was able to actually work with Louis and even give him supportive advice about his complicated relationship. No longer is this type of conversation “not his area” and I hope we see much more of this side to him. It was also lovely to see Donna and him getting back to the witty banter of past years. Yes, I hope they end up together, but for the moment, I’m fine with the type of fun they used to have in earlier seasons coming back to the screen. As well as making peace with Harvey this week (and nailing the best line of the episode when discussing his upcoming wedding! ), I was pleased to see Mike forging ahead with his desire to try and help people via his work at the legal clinic. The fact it wasn’t easy due to his conviction made the story all the more plausible. We saw Mike as a man growing up and trying to do the right thing, even if it’s tough. It was disappointing for me therefore, that the episode ended with him and Harvey yet again looking towards the grey areas of the world to get what they want. As much as I’d love to see Mike and Harvey working together again, how they handle this plot is crucial. From a reality perspective, if they do succeed in getting Mike a hearing to be considered for admission to the Bar (which is the equivalent of their professional body, not just an exam/committee), I hope they don’t just suddenly magic everything fixed, as that is not how it would work and although this is a television show, the solution they come up with has to be one that could happen in the real world for me to take it seriously. I suppose time with tell. I also hope it doesn’t jeopardise Rachel’s hearing, as that could ruin her relationship with Mike! Will Harvey (Gabriel Macht) get to hear some home truths from The Donna?! We’d heard that this week also marked the start of Donna’s own arc. She’s always been integral to the series and on the few occasions we’ve focused more on her (series four’s Intent as an example), they have been some of the best episodes of the series. Yes, I think “The Donna” is fun, it’s lovely to see more of David Reale as Benjamin and there is potential for some highly entertaining moments by introducing it (picture Louis turning to it for advice and it putting him in his place, or Harvey not realising it’s on her desk when she’s no there and it giving him sass), but I was hoping for something with a bit more depth for her. I have faith in Aaron Korsh and Sarah Rafferty is always a joy, so fingers crossed this doesn’t simply turn in to a gimmicky storyline. Having said that, if Harvey ends up getting disbarred for what he’s about to do with Mike, he may need to live off Donna and her possible millions! So, overall, 6.13 provided some lovely character moments and although I’m not hugely satisfied with Mike’s decision or the start of Donna’s arc, it did what Suits is best at, which is keeping the audience guessing as to where exactly it’s headed. Will Mike get a hearing for admission to the Bar? Will these actions have consequences for Harvey? Will Mike and Rachel actually make it to their vows (for those of us rooting for the Best Man and Maid of Honour, they better do!)? You can watch the promo for the next episode at SpoilerTV here. Suits series 6 continues with episode 6.14 “Admission of Guilt” on USA Network next Wednesday in the States and with this episode 6.13 on Dave on Sunday at 10 p.m. in the UK. Last week’s mid-season premiere, saw the family of Pearson Specter Litt coming to terms with the departure of Jessica Pearson (we miss you already Gina Torres) and Donna approaching a usually off-limits subject with Harvey – his complex relationship with his mother and its impact on him as a person. The fact he even allowed her to discuss the matter demonstrates the steps he’s already made following therapy in series five, but the prospect of him finally confronting his past demons has been highly anticipated by fans of the series. 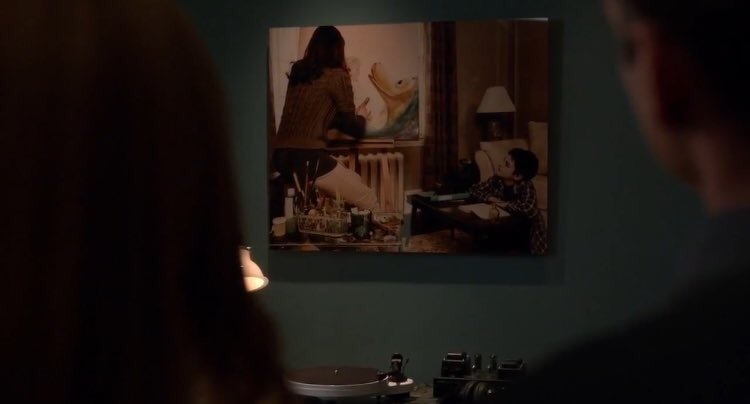 The great news is that episode 6.12, entitled “The Painting” not only tackles this emotional subject with sensitivity, but proves to be one of the strongest episodes Suits has ever had. The fact that six seasons in, the writers are still producing stories of this quality is a testament to the series as a whole. The episode has two strands, one focussing on Mike and his pursuit of a fresh start following his release from prison and subsequent decision not to return to PSL and the other following Harvey, as he travels to Boston to try and reconcile with his mother, after 20 years of pain and anger. After he receives an offer of work at a legal clinic from out of the blue, it’s great to see Mike getting his teeth back in to the law, with work that will truly make a difference to the lives of his clients. He said during his trial that it was these types of cases that made him want to be a lawyer, so hopefully this new path will help him to rebuild his life after prison. I assume his position there will at some point lead to conflict with his former firm, but I guess time will tell. It will also be interesting to see if Mike will ever be able to be a real lawyer, which would be a much steeper hurdle to overcome (although not impossible in the state of NY). In the meantime, this episode allows Mike to start again, with a clean and honest slate. It also lets him be the teacher in the same way Harvey was to him, which is fun to see. We also potentially see a more mature Louis Litt in this hour, as he puts his anger towards Harvey aside for the sake of the firm and steps up to the reality of Specter and Litt being a team. I really hope this lasts and that the rest of the series sees more teamwork between these two. The heart of this story, however, is Harvey and we see more character development here than we have to date. Those that view him as an arrogant, cocky, detached individual haven’t been paying attention to the facets of his character, which we have gradually seen since the series began. Hiring Mike helped give Harvey someone to protect and care about, having Donna in his life helps give him perspective, but even with such influences, Harvey’s emotional limitations have always remained and these were a direct result of his childhood and subsequent relationship with his mother as an adult. I’ve seen some comments online about him having a childish reaction to his mother’s behaviour, but that’s too simplistic a view. It wasn’t simply the fact that his mother repeatedly cheated on the father that he adored (although had you understood that you’d caught your mum cheating from as young as he was the first time, then it would be bound to affect you). The real damage was due to his mother asking him to cover for her and putting responsibility for any fallout if he told the truth on him. He may have been a young man then, but the pain and mistrust and indeed guilt that would cause a person cannot be underestimated. If you watch episode 5.10 before this one, it reminds you of just what past difficulties the Specter family had and when you combine this with the flashbacks here to his father’s funeral, you see what a mountain there is to climb to heal their wounds. What the writers do wonderfully is show the past pain immediately before the current reality. It adds to the tension, as we know how much is at stake. Having the scene at his father’s wake directly before the dinner with his mother, really heightens how big a step this trip is for Harvey. A couple of years ago he would never have boarded the plane. It’s made all the more emotional and sad when we learn how he’d tried to make peace seven years ago, before coming face to face with Bobby. Brynn Thayer is fantastic as Lily Specter and we see how she is similar to him in some respects, as they are both stubborn individuals; had she considered her son seven years ago, she perhaps could have foreseen what Bobby’s presence at his father’s funeral would do to Harvey. True, he could have handled it better, but had Bobby not been there, the last seven years may have been so different. Crucially their relationship and therefore the pain they each hold, feels very real and believable. A new chapter for Harvey & Donna? There is also a strong performance from Billy Miller as Harvey’s brother Marcus, who has always been in the middle of this broken family and has perhaps suffered more than anyone. He lost his happy family, which resulted in his later problems and then had to accept he could never have his whole family together. We’ve always been aware that his brother meant a great deal to Harvey and its his revelation that he didn’t bother to tell him he was seriously ill, which has the biggest effect. Harvey can no longer deny the pain his continued anger is causing to more than just himself. Gabriel Macht is simply superb in this episode. He has always been able to display the many facets of Harvey’s character and I’m still irritated that his work during series 5 in particular wasn’t acknowledged at the awards. Yet, in this hour he manages to take his performance to another level, as we see both past and present Harvey and the pain they feel. However, its the raw vulnerability of the character that packs the biggest emotional punch. We’ve never seen Harvey this exposed and the final scene with Lily is truly heart-wrenching, as we see him forgive her as well as himself. His journey then comes full circle; back to the office, back to Donna. She has been his strength and support all these years, gently helping to open him up to emotions and it’s lovely to see him acknowledge this, but also that he wants her by his side as he starts a new, more positive chapter in his life. Let’s face it, he could have put the picture up on his own, but he wanted her to share that moment with him. As someone rooting for these two, I’m excited to see how a more emotionally open and happy Harvey will choose to move forward, especially as we know that Donna’s life is going to change in some way over the next four episodes. Whether this leads them to one another, or if Aaron Korsh will hold this back until nearer the end of the show remains to be seen. However, no one can argue that Harvey has never been more ready than he is now to move forward with his life and allow himself to truly love someone. After such a powerful, emotional episode, I understand next week’s is a more comedic affair, which I’m very much looking forward to. It may be season six of Suits, but the cast and creative talent behind this series is by no means slowing down and with a seventh season already confirmed, I’m excited to see what will unfold over the final four episodes of this year. Suits season six continues its run on Wednesdays on USA Network in the States and Sunday nights at 10 p.m. on Dave in the UK. For my more general thoughts on the show as a whole, feel free to read my series review. All comments very welcome!